Producing music from start to finish is a time consuming process. There’s so many micro decisions going into a song. Having a workflow that speeds up the process makes all the difference. Too often producers waste time with tiny details that are not related to the track at hand. When you’re producing, you want to get what’s inside your head into the computer as fast as possible with as few steps as possible. This is where you create some of your best work. When you’re in the creative zone and ideas are seamlessly flowing out of you into the computer, the only way to have this seamless connection is to have a decent workflow set up. Preparing workflow begins before you even start a track. I’ve compiled a list of workflow tips that are proven to increase productivity and creativity. While this list might not be a comprehensive kist if ideas, my tips are guaranteed to make you a better producer. Before you start producing it’s important to have an idea of what you will produce. There are times for experimenting and seeing what develops, but most of the time you should have a focused goal. Not having a clear picture will lead to unfinished tracks. Scrolling through a massive list of samples does not make good use of time and will disrupt creativity for the session. 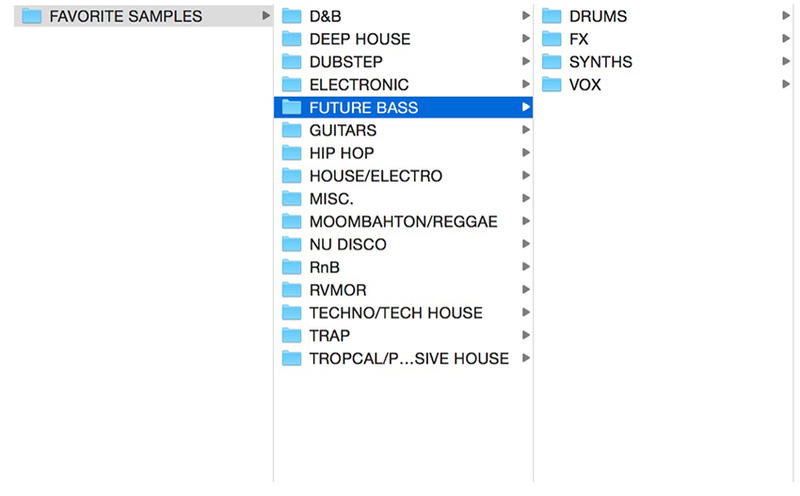 Create a folder with samples and presets that are in the style or genre that you want to produce. This may seem obvious, but many producers do not do this and it will save you an enormous amount of time. Sometimes the stock key commands that your DAW gives you do not make the best use of the keyboard. Creating custom key commands that turn two handed key commands into a one handed key command is a very effective way to cut back on time in the long run. DAW’s such as Ableton and Logic allow you to map many of their functions to the key commands and you should take advantage of this. Making key commands and converting the gestures into your muscle memory will turn you into a machine, so you can keep your focus on creating the actual song! Look at where you place your hands on the keyboard and program one handed key commands around this in your DAW’s settings. Taking it a step further, applications such as better touch tool allow you to take your track pad or your mouse and create even more custom key commands or re-assign key commands to different gestures on your trackpad or mouse buttons. Over time you’ll, inevitably, amass a number of plugins. You may forget what many of them are. And long lists become puzzling. This can all be fixed by categorizing the plugins. This will save you time in the long run and will have a positive effect on mixing and creative decisions. I used Ableton’s Audio FX racks to accomplish this. by grouping the plugin and saving it. From there, go to User Library > Presets > Audio Effects > Audio Effect Rack and create a list of folders to categorize the plugins such as compressors, delays, channel strips, and so forth. This will require you to invest some time depending on how many plugins you have. If you are not using Ableton, you can use software such as Auganizer to organize the plugins. This is the biggest one. It’s a ton of work (depending on the library size), but worth it. Not to mention, it saves a ton of hard drive space. When you go through all the samples, you’ll realize there’s a lot that sound the same. Deleting these will save space help with rationalising and understanding the library. Everybody wants an organized sample library, but nobody wants to work for it. Set aside a little time each day for organizing and you’ll thank yourself later. There is a right way to organize your samples though. Dumping thousands of kicks into a single folder is not enough to really reap the real benefits of organizing. Going one step deeper is necessary. Create sub folders that are labeled by a distinct sonic character. In that kick folder have subfolders that are labeled Short, Medium, and Long to indicate the length of the kick. Create another set of subfolders such as High Range, Mid Range and Low Range to tell what sort of frequency content the sample has. The type of subfolders to create should be what makes sense to you. Go through the different characteristics of the sound such as length, frequency content, style, etc. to get a good idea of what folders you want to create. Key labeling is also important and very time consuming. Your workflow will increase exponentially as you can instantly find a sample with no time at all when you are in the creative flow of the track and you think of a specific type of sound you want. It is important to save all the chains of plugins that you create for each instrument that you make and like, so you can easily recall those settings in a future track. What is also important is to save the chains that you use more often. All DAWs should have the option to either save an effect rack, the channel strip or any number of plugins on a channel with all the settings saved. For every group of plugins that you find useful in productions, save them and organize them in a specific folder so you can easily recall the chain when you are looking for that particular sound. For example, if you’re working on vocals, you’re always going to add an eq, reverb and delay. Consider having a chain already saved for this. When working on a kick, eq-ing and compression are mostly always used, so create a chain with an EQ and compressor. You should consider dialing in specific settings and label them according to the specific FX or mix setting. Becoming a more productive producer does not just come down to how skilled you are. With extensive organization you can supercharge your workflow and become more efficient. The tips mentioned above will take hard work on your part, but in the end, it will make you a more productive producer, guaranteed.